OCCUPATION: Politician, Engineer, Architect, Journalist, Musician. Herbert Macaulay was a Nigerian nationalist, politician, engineer, architect, journalist, and musician Legend says he is the founder of Nigerian nationalism. 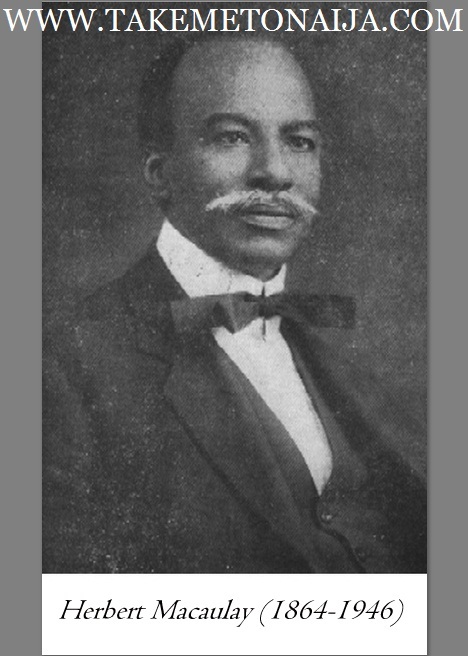 One of the first leaders of the Nigerian opposition to British colonial rule, he was also a civil engineer, journalist, and accomplished musician. Olayinka Macaulay Badmus was born in Lagos on 14 November 1864 to Thomas Babington Macaulay and Abigail Crowther, children of people captured from what is now present day Nigeria, resettled in Sierra Leone by the British West Africa Squadron, and eventual returnees to present day Nigeria. Thomas Babington Macaulay was one of the sons of Ojo Oriare while Abigail Crowther was the daughter of Bishop Samuel Ajayi Crowther, a descendant of King Abiodun. Thomas Babington Macaulay was the founder of the first secondary school in Nigeria, the CMS Grammar School, Lagos. After going to a Christian missionary school, he took a job as a clerk at the Lagos Department of Public Works. From 1891 to 1894 he studied civil engineering in Plymouth, England. On his return, he worked for the Crown as a land inspector. He left his position in 1898 due to growing distaste for the British rule over the Lagos Colony and the position of Yorubaland and the Niger Coast Protectorate as British colonies in all but name. Herbert Macaulay was an unlikely champion of the masses. A grandson of Ajayi Crowther, the first African bishop of the Niger Territory, he was born into a Lagos that was divided politically into groups arranged in a convenient pecking order – the British rulers who lived in the posh Marina district, the Saros and other slave descendants who lived to the west, and the Brazilians who lived behind the whites in the Portuguese Town. Behind all three lived the real Lagosians, the masses of indigenous Yoruba people, disliked and generally ignored by their privileged neighbours. It was not until Macaulay’s generation that the Saros and Brazilians even began to contemplate making common cause with the masses. Back then, Lagos was a segregated town. Europeans stayed in the best parts of town, migrants from Brazil and Sierra Leone stayed elsewhere, natives, elsewhere. Herb attended his father’s school, CMS, then Fourah Bay College in Freetown, Sierra Leone. He returned to Lagos in 1882 and got a job in the Department of Public Works. In July 1890, he left the Lagos Colony for Plymouth in England, to study Civil Engineering under G. D. Bellamy. He was there for three years. When Macaulay returned to the Lagos Colony in 1893, he was appointed Surveyor of Crown Lands by the colonial government. However, he resigned five years later, because of what he termed “racial discrimination against indigenous civil servants by the European elite”. Following his 1898 resignation from the Department of Works, Herb Macaulay established his own private practice in Lagos. However, Macaulay’s venture was not a success, and faced with financial distress, he defrauded a family dependent, and was caught and sent to prison for two years. This prison stint, effectively barred him from ever running for public office under the colonial administration. Upon his release from prison in 1908, Macaulay became more involved in the political arena, and began contributing a weekly column to the Lagos Daily Times. His articles were often critical of government policy, the liquor trade; the water-rate scheme; taxation; racial segregation; attempts to deny indigenous land ownership; and a free press. In 1915, Macaulay led protests which became known as the water rate riots and also led agitation against colonial plans for land reform. His articles often skirted the edges of sedition, and finally, he crossed the line, giving the government the chance it needed to put him in prison again. This second visit to the jailers (for six months) involved the publication of a rumour concerning a plot to assassinate the exiled Eleko of Lagos. After his release from prison, Macaulay took a somewhat more cautious line, but his writing remained highly critical. In 1921 he went to London with the Eleko of Lagos to act as his translator in the legal appeal of a local land tenure case. Macaulay proclaimed that the British colonial government was eroding the power and authority of the Eleko, who, he said, was recognized by all Nigerians as the rightful king of Lagos. This episode embarrassed the British and established Macaulay as a leading advocate of the rights of traditional leadership in Lagos. A brief synopsis of the Oluwa Affair: the colonial authority had bought a large parcel of land(255 acres) from the Oluwa Family, and underpaid for it. Chief Oluwa sued for better compensation, and following that trip to London, on 14 June 1921, the Privy Council ruled in favour of Chief Oluwa. The Privy Council’s ruling said that communal land-ownership was legally recognized and that due compensation should be paid. The Eleko Affair: Macaulay campaigned for the rights of traditional rulers within the colonial structure, and alleged that the colonists wanted to kill the Eleko. Again, the Privy Council, also on the same trip to London, ruled in favour of Macaulay’s side. These victories hardened political lines. In 1922 a new Nigerian constitution was introduced providing for limited franchise elections in Lagos and Calabar. In 1923, he started the Nigerian National Democratic Party (NNDP), which contested the very limited elections of African members of the Legislative Council. The NNDP’s motto was “salus populi suprema lex”, “the safety of the people is the greatest law” and it called for universal compulsory education for Nigerians. NNDP candidates won all the elective seats in the Nigerian legislature between 1923 and 1938. But then in 1938, things changed. The NNDP’s dominance was cut short in 1938 when the Nigerian Youth Movement beat them in the elections for the Lagos Town Council. Following that defeat, Macaulay, who up until the time was not too interested in politics outside of Lagos, adopted a more pan-Nigeria outlook. He saw prospects in Nnamdi Azikiwe’s NCNC’s struggle for independence for all of Nigeria, and by August 1944 had reached an agreement with Zik. Many of his own party members did not want to join forces with the NCNC, but he threatened to resign if they didn’t, so they played ball. By the time Macaulay’s merger with Zik’s NCNC was complete in August 1944, Macaulay was already 80 years old and in failing health. In 1946, Macaulay suffered an acute attack of rheumatism during a tour of Kano, and was brought back to Lagos. Herbert Macaulay died, aged 82, on 7 May 1946. Let us get one thing straight. Herbert Macaulay was no saint. He had an opportunistic streak. He was, in his time, certainly very controversial. Obafemi Awolowo described him as “ultra-radical, intensely nationalistic and virulently anti-white”. Piers Brendon described Macaulay in later life as “an angry old man in a white suit and a white moustache that stuck out like cat’s whiskers”. Fred Lugard, who was in many ways Macaulay’s greatest adversary consistently passed bitter comments about him and called him duplicitous. Macaulay was rumoured to have popped a bottle of champagne when he heard of Lugard’s passing in 1945. Margery Perham, Lugard’s biographer, who visited Macaulay in 1931, described him as “one of the ablest Africans I have met, and at one both dangerous and pathetic”. The year Macaulay left civil service, he got romantically entangled with Caroline Pratt, who happened to be the daughter of an African Police Superintendent. They later got married but the union came to an end in August 1899 following Caroline’s sudden death. They had no kids from the marriage. Even after her death, he maintained good relations with the Pratt family and saw to their welfare. A devastated Herbert later married Maria Pase but some records indicated that he also kept a string of mistresses who bore him a battalion of children. Caring for the kids sapped his pockets but he had no option. Herbert was the fifth child (out of seven) of his parents and his siblings included Owen Emeric Macaulay (died in July 1909, was Abigail’s eldest son), Thomas Fowell Buxton Macaulay (second child, died in September 1928) while the third sibling was Hugh Stowell Macaulay. In 1946 Macaulay fell ill in Kano and later died in Lagos. The leadership of the NCNC went to Azikiwe, who later became the first president of Nigeria. Macaulay was buried at Ikoyi Cemetery in Lagos on 11 May 1946. Nnamdi Azikiwe delivered a funeral oration at Macaulay’s burial ceremony. As many may not presently, Herbert Macaulay is the image on the Nigerian one naira note and coin in respect for his heroism and legendary. The one naira note or coin may no longer exist in the Nigeria monetary world.